THE APPROPRIATE PROCUREMENT METHODOLOGY – PIT BULLS OR A PRECISION DOGSLED TEAM? It is inevitable that a CEO is required from time to time to pull the trigger to commit funds and begin a Capital Improvement Project (CIP). No doubt a painful responsibility as “CIP” translates to big dollars and an additional line on the already stressed CEO’s to-do list. Perhaps a new or expanded facility or a major leasehold improvement, there is nothing insignificant about a non-recurring large dollar CIP expenditure requiring special planning, implementation and tracking. 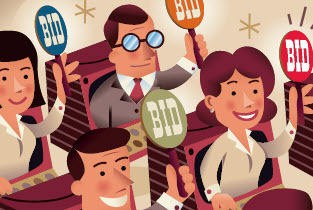 This old school low bid methodology, known in the industry as ‘Design/Bid/Build,” naturally sets the stage for adversarial relationships between all of the stakeholders. Finger pointing, claims for contractual change orders, disputes and law suits often follow. There are no perfect stakeholders, there are no perfect contractors, no perfect designers, and most certainly no perfect owners. You can take it to the bank, literally, that this is the case, and why “contingencies” are built into budgets. The final insult to the low bid process is to place three imperfect contractors into a low bid street fight. Liken it to placing pit bulls in a fighting ring, and you should fully expect the winner to emerge bloody, wounded, and in a very defensive and foul mood. The contractor is coming out of the chute looking for ways to recoup the lost margin caused by all the stakeholder’s imperfections – not a great way to start a capital improvement program. A decade or so ago a much improved CIP procurement methodology began to get traction with the stakeholder industry groups. Commonly known as Construction Manager At Risk (CMAR), it allows the owner to interview and select a contractor before the design begins. The CMAR firm is selected based upon qualifications, experience, and compatibility with the owner’s team. A fixed-fee is negotiated up front, and the CMAR firm will establish a guaranteed maximum price at the appropriate point in the process. In contrast to a procurement scenario of adversity and bloody pit bulls, the CMAR methodology sets the stage for a team effort. The CMAR firm works closely with the owner and design firm toward common goals of optimum design with continuous budget control and a realistic schedule. Think precision dogsled team in contrast to a dog fight. And Where’s The Competition to Keep The Cost Down? First of all, once the CEO and the team slows down long enough to listen, understand, and think about the CMAR process, they invariably realize that what’s really being talked about is BEST VALUE as opposed to a LOW BID mentality. Best value is the true target, and CMAR has proven to be the best delivery methodology. It hits the bull’s eye for best value. Additionally, the CMAR firm manages all of the subcontractors involved in the project and commonly receives multiple proposals from invited and prequalified subs. In effect, controlled competition is taking place up and down the food chain including subs and suppliers. The CMAR delivery method for capital improvement projects has proven to be a preferred delivery method. Even school districts and governmental agencies at every level are increasingly using CMAR and similar “best value” procurement. The major industry professional associations (Associated General Contractors of America, American Institute of Architects) have long ago developed standard contract documents for CMAR. Most of the large design firms are familiar with CMAR, however many of the small firms are clueless about contemporary delivery methodologies and automatically go to the old school default of “Design/Bid/Build.” It’s simply a matter of time before CMAR becomes the default. BEST VALUE and precision dogsled teams make more sense than dog fights. Mike Novak is CEO/President of the Novak Group, construction managers and energy solutions specialists based in San Antonio.